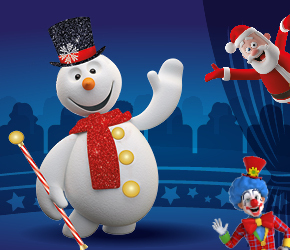 Frosty the Snowman has always been a huge fan of the circus, so when he gets the chance to join the Christmas circus, he just can’t say no. There’s only one problem, he can’t do any circus acts! Come and join Frosty as he causes mayhem in his quest to become ‘The Greatest Snowman’. After the show each child will meet Santa and if they have been very good, they will receive an early Christmas present! Under 2’s go free with a paying adult – must sit on an adults lap. For your child to receive a gift, a ticket must be purchased please. Save 10% for group booking of 10 or more.